Fondazione Fotografia Modena presents Movements and Variations, a solo exhibition by internationally acclaimed Los Angeles-based artist Sharon Lockhart (b. Massachusetts, United States, 1964). Hosted in Fondazione Fotografia’s temporary exhibition venue MATA, a former tobacco factory located in Modena’s city centre, the show introduces three new, interconnected series of photographic and sculptural works, conceived especially for this venue and inspired by its workers’ social activism. Throughout her career, Lockhart has immersed herself in communities to make works – including photographs, films and installations – that uniquely capture groups and individuals through studied, choreographed compositions. The points of departure for Lockhart’s new works stem from her ongoing interest in portraiture, representation, movement, labour and the power of women. Comprising casts of manzanita, buckeye, and black walnut sticks that Lockhart gathered in California’s Sierra Nevada Mountains, A Bundle and Five Variations (2018) is the artist’s first engagement with bronze sculpture. Lockhart previously featured similar sticks in her film Little Review (2017). In collaboration with Ravi GuneWardena from the Sogetsu School of Ikebana, these sculptures have been grouped into six distinct arrangements, five of which are derived from the larger bundle on view. Balancing form and weight, the sculptural iterations reflect both the natural and constructed relationships of the sticks. 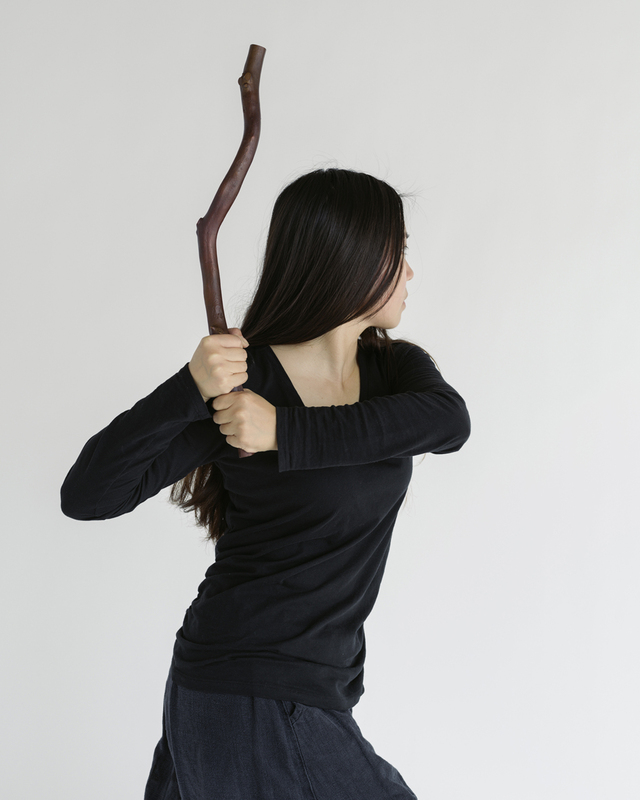 With a similar focus on structure and variation, for the photographs in Nine Sticks in Nine Movements (2018), Lockhart and the protagonist of the shots, Sichong Xie, worked together to generate a movement for each of the bronzes. Each position is devised with reference to a myriad of poses from social and art historical sources. 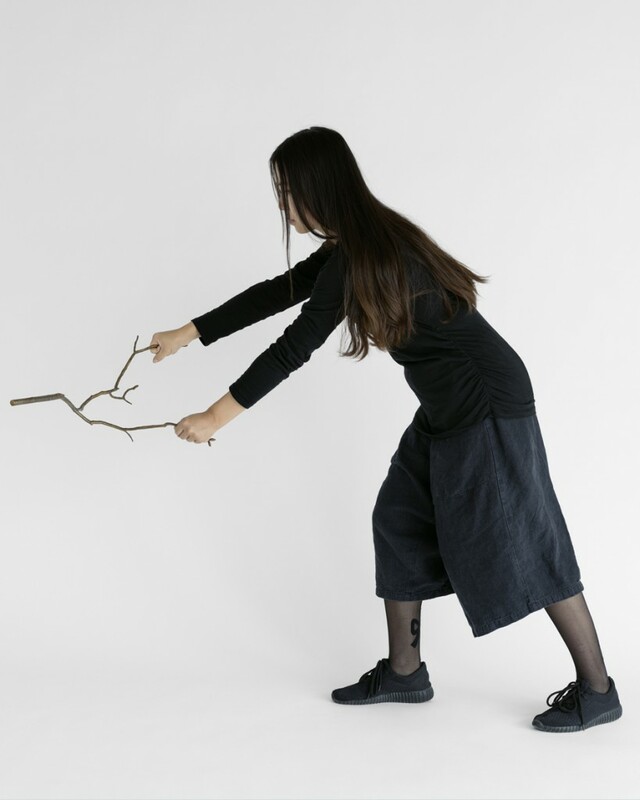 Like a dance, the photographs – alongside the sculptural arrangements – capture the interplay between choreography and the physicality of the bronze sticks. Drawing from exchanges between the artist, the curators and Fondazione Fotografia Modena, the exhibition also engages with the politically charged history of the site, a former tobacco factory that was, at times, staffed by an entirely female workforce. The show includes a selection of images from the archives of the well-known photo studio Botti e Pincelli, owned by the City of Modena and now managed by FONDAZIONE MODENA ARTI VISIVE. Shot in 1963 and in 1968 but never published, these black-and-white photos depict demonstrations of farmers distributing potatoes to workers of both the tobacco factory and the nearby Corni Foundries, as well as dumping milk on the road, in an act of protest against the economic policies introduced by the Italian government to regulate agricultural tariffs. They parallel another form of self-determination and economic autonomy that Lockhart captured in her ‘independent business’ photographs – Dirty Don’s Delicious Dogs, Moody Mart, and Handley’s Snack Shop (all 2008) – which will also be featured in the exhibition. Part of Lockhart’s larger Lunch Break project, these photographs depict makeshift stands used by the workers of a major American shipbuilding company. Although specifically prohibited by the factory’s management, the stands line the corridors of the workshops and provide food and beverages to other workers in an act of defiance against the mass-produced goods sold by the management at inflated prices. Among the most important exhibitions by Sharon Lockhart are her solo shows in the Polish Pavilion at the 57th Venice Biennale (2017); Kunstmuseum Luzern (2015); Bonniers Konsthall, Stockholm, (2014); Ujazdowski Castle Center for Contemporary Art, Warsaw (2013); EACC Espai d’Art Contemporani de Castelló, Castellón de la Plana, Spain (2012); LACMA, Los Angeles County Museum of Art, Los Angeles (2012); Kunstverein Hamburg, Germany (2008); Museum of Contemporary Art, Chicago (2001); and MAK – Österreichisches Museum für angewandte Kunst, Vienna (2000). Her works have been presented in many biennials, including the Shanghai Biennale (2014); the Liverpool Biennial (2014); and the Whitney Biennial (1997, 2000, 2004). They are to be found in major museum collections, such as that of the Solomon R. Guggenheim Museum (New York), Hammer Museum (Los Angeles), Metropolitan Museum of Art (New York), Museum Boijmans Van Beuningen (Rotterdam), Tate Modern (London), and Sammlung Goetz (Munich).